Are you completely ‘sports mad’? If so, there’s a relatively new phenomenon taking over the online gaming world that allows you to enjoy sports matches, even when they aren’t actually happening! Popular sites like Caesars Casino Online now offer their visitors the chance to bet on their favorite sports, without having to worry about waiting for match day, or half time to be over to find out the result. Today, we’re revealing a little more about the new trend and running through where to try it for yourself. What are online virtual sports? Online virtual sports allow lovers of sport and electronic entertainment to participate in entirely online leagues, featuring your old favorites or fictional teams competing to become champions. Everything is set up as it would be down your local betting shop, only without having to venture outside! Each virtual team and individual comes with their own specific stats, ranging from their height and their goal scoring record, to their win/loss ratio or their average speeds. This allows you to brush up on their expertise and to make informed decisions before you make a wager. Rather than having to wait the full 90 minutes or the length of a race for a result, the outcome is decided by a random number generator (RNG), which takes into account the skills of the players/ animals on the field or track. As a fun added dimension, you’ll get to watch a computer-generated highlights reel of the action, which keeps things interesting and gives you a taste of the delicious tension you feel while watching a real-life sports match or race! If you’re looking to dive into the world of online sports, your best bet is trusty favorites, Caesars Casino. 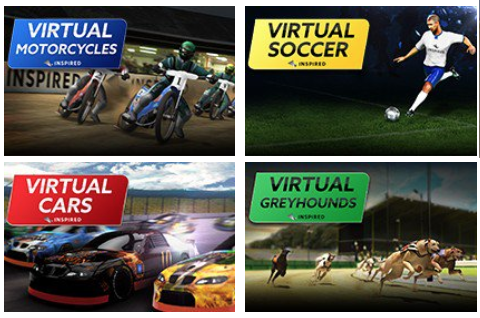 In addition to virtual soccer you can also try your hand at a range of virtual racing options including car and motorcycle racing, horse and greyhound racing. All the excitement of the track – without any potential for rain!